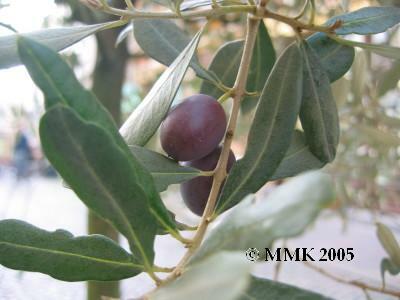 The olive is an evergreen tree growing to 15m in height with a spread of about 10m. The tree can be kept to about 6m with regular pruning. The graceful, billowing appearance of the olive tree can be rather attractive. Olives are long-lived with a life expectancy of 500 years. The trees are also tenacious, easily sprouting back even when chopped to the ground.The olive's feather-shaped leaves grow opposite one another. Their skin is rich in tannin, giving the mature leaf its grey-green appearance. 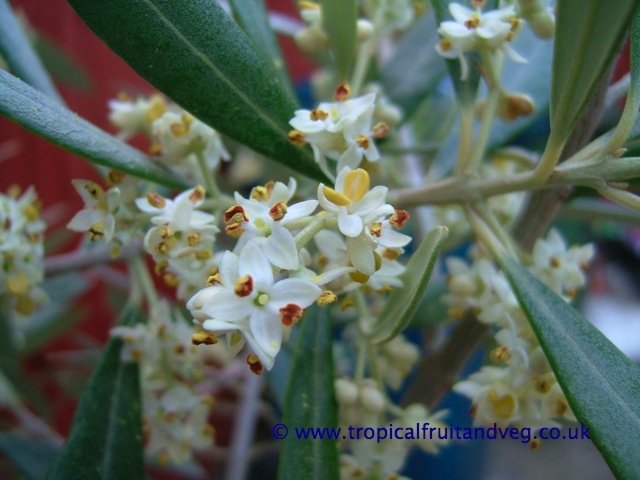 The leaves are replaced every two or three years, leaf-fall usually occurring at the same time new growth appears in the spring.The small, fragrant, cream-coloured olive flowers are largely hidden by the evergreen leaves and grow on a long stem arising from the leaf axils. The olive produces two kinds of flowers: a perfect flower containing both male and female parts, and a staminate flower with stamens only. 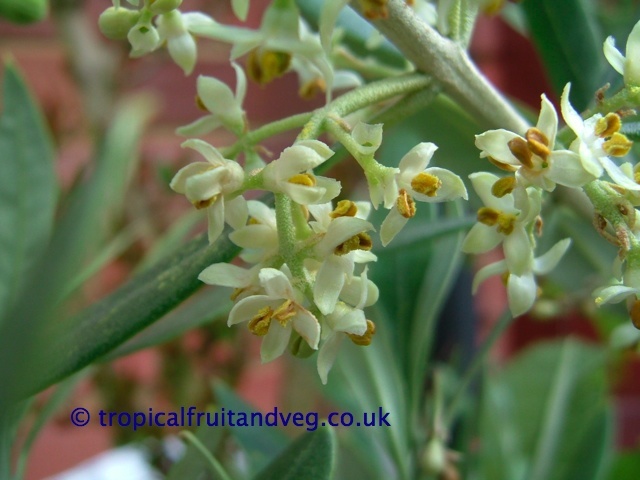 The flowers are largely wind pollinated with most olive varieties being self-pollinating, although fruit set is usually improved by cross pollination with other varieties. 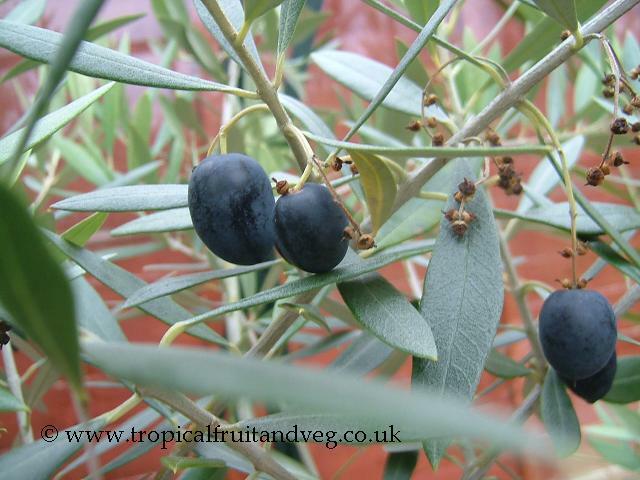 The olive fruit is a green drupe, becoming generally blackish-purple when fully ripe. A few varieties are green when ripe and some turn a shade of copper brown. The cultivars vary considerably in size, shape, oil-content and flavour. The shapes range from almost round to oval or elongated with pointed ends. Raw olives contain an alkaloid that makes them bitter and unpalatable. A few varieties are sweet enough to be eaten after sun drying. Thinning the crop will give larger fruit size. The trees reach bearing age in about 4 years. Olive trees like cool/cold winters and hot summers. 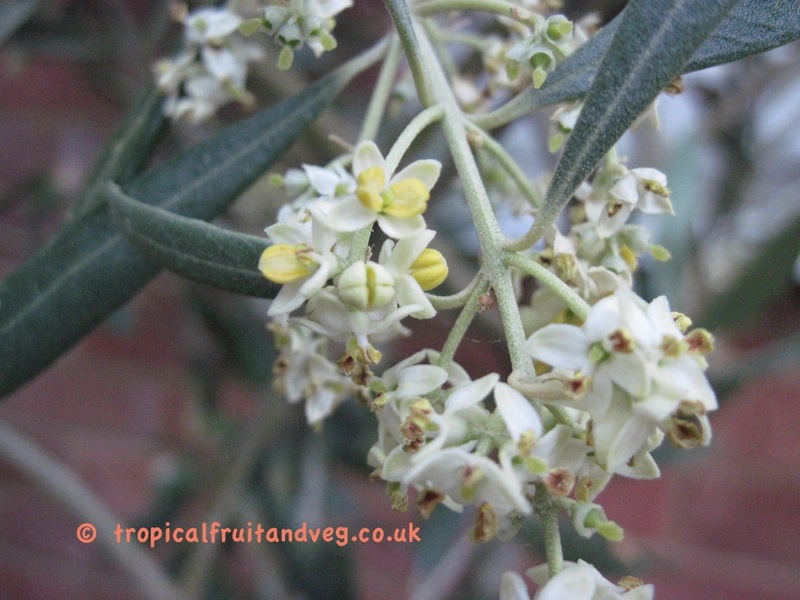 Even though olives are evergreen trees, they still need a cool winter so they can rest to prepare for their main shooting, flowering and fruiting in the spring. For most varieties some winter frost is preferred. Olive trees show a marked preference for calcareous soils, flourishing best on limestone slopes and crags though the tree will grow in any light soil, and even on clay if well drained. Ideal pH is 7-8.